In 12-inch skillet, heat 2 tablespoons of the butter over high heat. Add onions; cook 5 to 7 minutes, stirring frequently, until tender. Reduce heat to medium; cook 15 to 20 minutes, stirring occasionally, until onions are deeply browned. Transfer onions to bowl. Meanwhile, in 2-quart saucepan, heat broth over medium heat until hot. Reduce heat to low; keep hot while cooking rice. In 4-quart saucepan, heat 1 tablespoon of the butter over medium-high heat. Stir in rice. Cook 2 to 3 minutes, stirring occasionally, until edges of kernels are translucent. Stir in wine. Cook 1 to 2 minutes, stirring constantly, until wine is absorbed. Reduce heat to medium. Stir in 1 1/2 cups of the hot broth mixture; cook uncovered 5 to 7 minutes, stirring frequently, until broth is absorbed. Stir in another 1 1/2 cups of the broth mixture; cook uncovered 5 to 7 minutes longer, stirring frequently, until broth is absorbed. Stir in remaining 1 cup broth. Cook 5 to 7 minutes, stirring frequently, until rice is just tender. 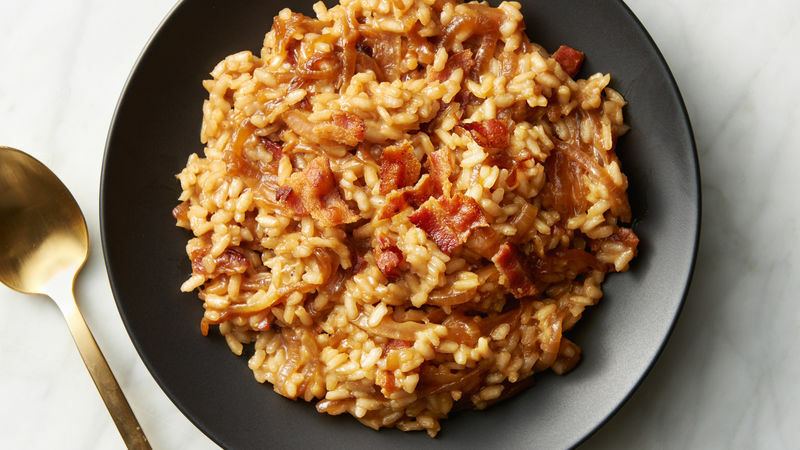 Stir in caramelized onions, Parmesan cheese, 1/4 cup of the cooked bacon and remaining 2 tablespoons butter. Stir vigorously until rice is creamy. Serve immediately, garnished with remaining 1/4 cup bacon. Serve with more Parmesan cheese, if desired. Heating the broth helps the rice cook evenly in a short amount of time. Arborio rice is a high-starch, short-grained Italian rice often used for making risotto. Find it in the rice and beans aisle of the grocery store.